It was Sunday. The time was 10.45am. Hubby was lying on the bed, Kz was jumping on him up & down, up & down. G just woke up from his morning nap. I was nagging Kz to stop jumping on the bed and to watch out for G, who was slowly crawling up to the bed as well. Hubby said "It's ok, let him be, it's family day". Family day? Rang a bell. Why don't you take us out, I asked. Where, he asked. Hmm, Farm In The City? Not very far from us. Ok, let's go, he said! We reached after 25 minutes drive. We didn't take the stroller. So I used the "kangaroo pouch" to carry G around. Ok, sorry for being long-winded, it's called baby-wearing ~ Carrier. 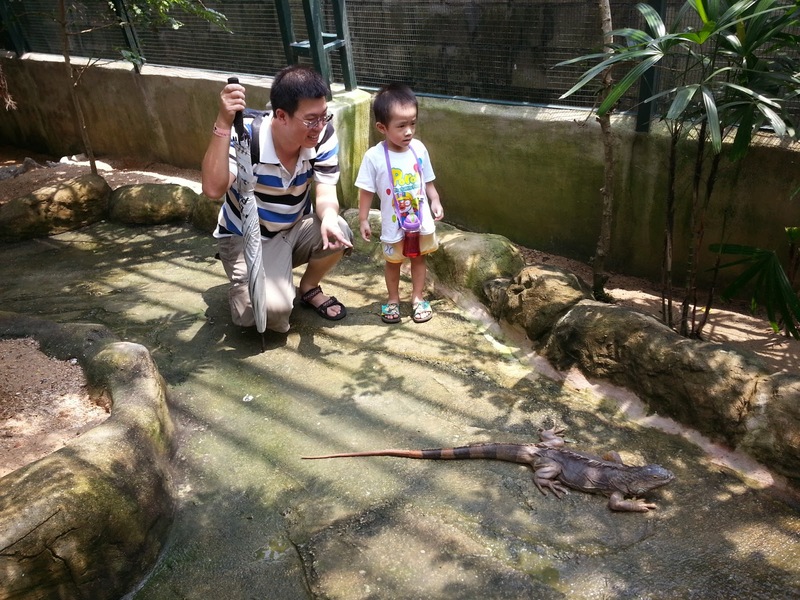 Kz had fun seeing turtles, birds, fishes, rabbits, guinea-pigs, ponies, reptiles. I was sweating so I didn't pay attention to the animals. I was just hoping to go home as soon as possible, but I didn't whine or complain, because I was the one who wanted to come. So not many pictures ya, sorry. Oohh, a family photo with the giant tortoise. We chose this photo to be converted into a mug as a souvenir before we left the place. Hi Louiz! Where exactly is this place? Looks like a nice family outing. I like the second photo. You look very pretty! Kangaroo pouch, baju and ribbon matching colour some more. Last photo also I like. That tortoise is big! Is this place the one around seri kembangan area? Yep, you are right, at Seri Kembangan..
Ooooo...this is so nice. Many city kids go through life never seeing these things...except maybe on TV. The iguana will just stay there like that, so good? Ours, we may get to see in the monsoon drains...and the moment they detect any movement, they would disappear already. Very fast! I guess they know that here, they may end up in somebody's cooking pot. Hehehehehe!!!! Haha, you are so funny STP.. Yep the iguana just stayed there, without moving much.. I think all the animals there already get used to people seeing or touching them, so they can't be bothered much, teehee..
Next time STP comes to KL, you can bring him there!!! He might catch the iguana back to Sibu and cook curry!! A nice family outing. Good to bring kids to see animals. 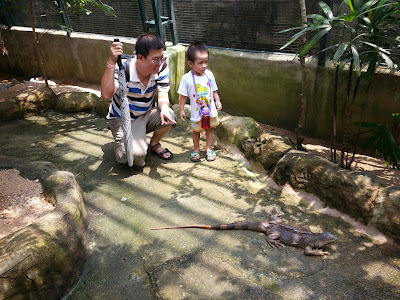 Both my kids love the zoo so much but our zoo very 'kesian'. Hubby says the same thing too, and refused to take us to the local zoo.. When I heard the title, I thought that's a FB games! So it took me by surprise that they have a mini zoo! It is definitely interesting for kids! 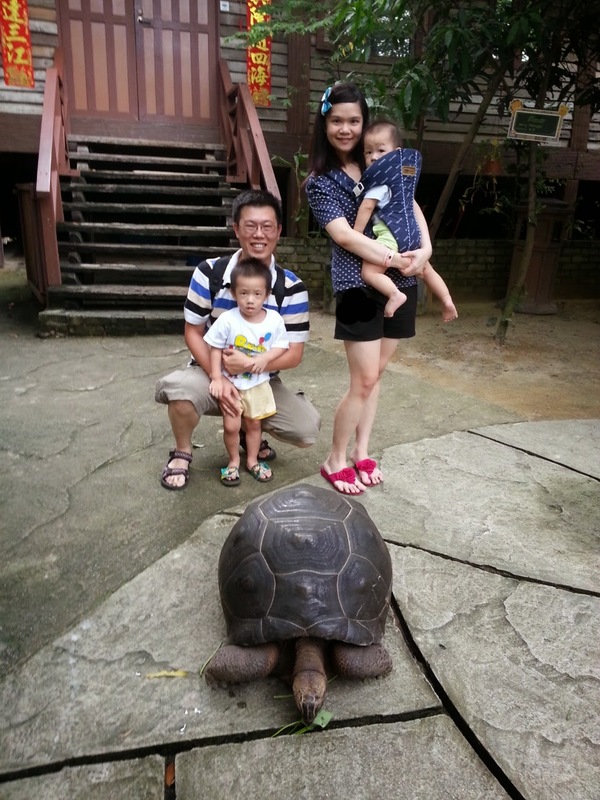 The family portrait is nice and would be funny if you all let the tortoise stand on 2 legs! Haha, the tortoise definitely could not stand on 2 legs.. Big eh? Wah, my heart beating fast when I read your compliments.. Very happy ahh, kekekeke..
Oh ... not easy to find this place but I manage to go in and see see. I didn't buy the tickets as I needed to go somewhere. Worth a visit, I think the kids will like it, but it's gonna be hot.. Bring hats, cold water, electrical fan..
Wow, that tortoise reminds me of Galapagos! Didn't know there's such a place. Thanks for the heads-up. 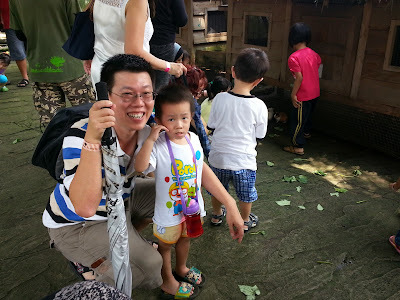 Another great place to visit is the KL Bird Park. I'd say it's a must-see place. And then you could pop over to the Orchid Garden just across the road. There are potted orchids for sale too, some as low as RM15. You'd need at least three or four hours visiting both so best to bring along drinking water and some snacks An umbrella or two as well, more so for the Orchid Garden but not for the Bird Park because the trees and netting above offer good shade.. I regretted not bringing any hats and cold water, but of course we could buy the water from the stalls inside the farm.. It was hot, and I was feeling sweaty and sticky, but kids will enjoy the visit.. Anyway, nice family photo! That tortoise is real one ar? I thought is fake one, hehehe, really very big leh! Aden likes to pet animals also, dogs, cats, birds, chicken and all... I think that's a good thing? Since we can sort of train our kids to love animals and not afraid of them... Hehe! Yep, interesting place.. I didn't know there's a "farm in the city", I read about it when some bloggers posted it about few months ago..
family day?? hahaha, everyday can be family day lah.. if not mistaken, you are not taking care of both your boys already?? sorry ah, lost track already, dunno when you mentioned about the day-care or nursery thing the other day, means your mum no longer take cares of G and you don't only see him during the weekends?? good lah, at least somebody took the initiative to declare a family day and then went for an outing.. errr, farm in the city, never heard about it before.. so it just looks like a mini zoo to me lah, since you only showed the photos you took with the animals.. farm, errr, i would expect they also have some other areas with plants and veggie and fruits orchards etc lah..
wah, so daring lah, went so near to that big lizards, i would just stand far away and then look one two eyes and quickly leave lor.. yes, i am super scared of all these reptiles lah, especially snakes!! OMG, so gerli lah.. and hey, the big tortoise family portrait.. you didn't show us how the customized mug looks like geh?? 1) I am taking care of both kids now already, I mean the kids are with us at home already every evening.. Mum is not taking care of G liao, we put him in the nursery downstairs of our condo.. So we pick him up every evening liao ma.. Kz pulak attends the kindy+daycare everyday, so we also pick him up after work every evening.. So yeah, now both kids with us liao..
2) Yep, mini zoo, or I would call it the petting zoo.. No canggih animals like elephants and tigers, only the small ones like rabbits la, deer la, tortoise la, etc..
3) Oh yeah, you have sharp eyes.. It's a chicken! Yep, very colourful, I was attracted too..
4) Yes, I was the one suggested going there, but hor, I didn't know it was gonna be so hot.. We didn't bring hats and extra clothes for the kids.. Kz no problem, he enjoyed running here & there, sweating and all.. But I didn't bring extra clothes for G, so he was sticky and sweaty while in my kangaroo pouch.. And I was sweating too, so can you imagine? 5) Those lizards and reptiles ahh, I think get used to human already seeing / touching them.. They will just stay still, and wait for you to come touch them la.. Errr, the mug ahh, very blur la, and my face looks fat, coz they kinda "elongated" it when they want to stretch the picture to make the mug.. Very ugly la, so I didn't show the mug, teehee..
looks like an interesting place. I should make a trip there one day..
Yep, interesting place, but remember to bring hats, umbrella, cold drinking water and wear sleeveless! Haha.. It is really a good idea for you to suggest going to the farm for a family day. 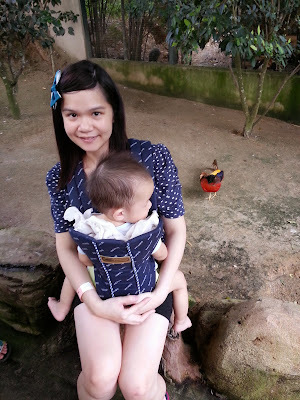 So hot but you can tahan - and so strong to carry your youngest son for so long - you are a superwoman! It was hot and I didn't expect it, darn, should've seen it coming.. I cannot tahan, made black face, but I controlled coz I was the one who wanted to come, and also to let Kz enjoy, so I didn't take many photos coz I was waiting to go home only, haha..
Ooohh, got new staff coming in ahh? Good lor, the hard part is the beginning only, to train them up, after that, ok liao..
Yup, not cheap.. RM60, for both adults.. Kids free.. 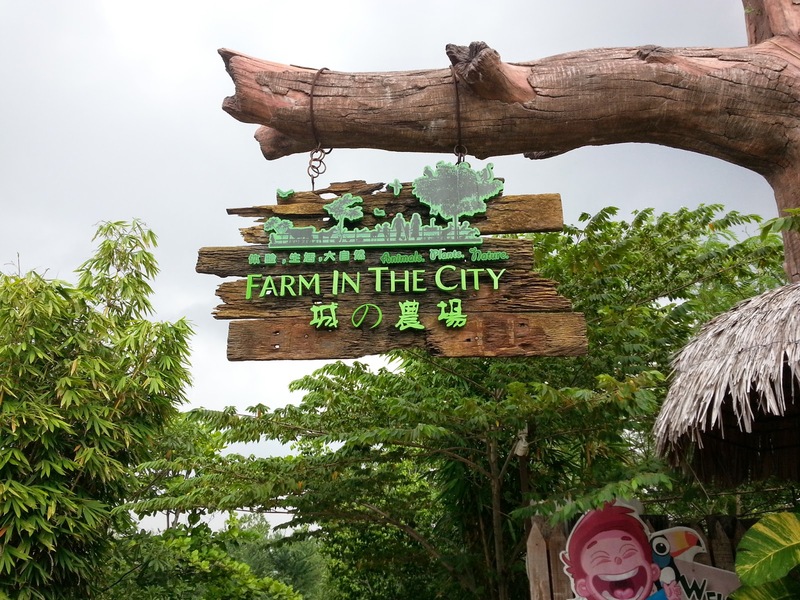 So if you bring many kids, and only 2 adults, kira RM60 jugak.. Cheap if you bring many kids.. Hehe..
Farm in the city! It sounds fun. Kz and your hubby seem happy at this trip. I have not converting any of our family photo into a mug, tees, calender or anything? Did you make just one mug? Then, who is going to own and use it? Yep, only 1 mug.. Call me kiamsap, it's RM30 per mug, haha.. This is fun! Nice photos. Where is this Farm In The City? First time heard about it! So you didn't enjoy yourself there? Haha!